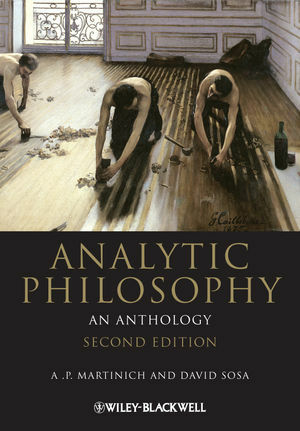 Featuring updates and the inclusion of nine new chapters, Analytic Philosophy: An Anthology, 2nd Edition offers a comprehensive and authoritative collection of the most influential readings in analytic philosophy written over the past hundred years. A. P. Martinich is Roy Allison Vaughan Centennial Professor in Philosophy and Professor of History and Government at the University of Texas at Austin. He is the author or editor of 15 books, including The Philosophy of Language (5th edn., 2007) and A Companion to Analytic Philosophy (edited with David Sosa, 2001). David Sosa is Professor and Chair in the Department of Philosophy at the University of Texas at Austin. Part I :Philosophy of Language. 1 “On Sense and Reference”(Gottlob Frege). 4 “On Referring”(P. F. Strawson). 6 “Truth and Meaning”(Donald Davidson). 7 “Identity and Necessity”(Saul Kripke). 8 “Meaning and Reference”(Hilary Putnam). Further Reading in Philosophy of Language. 9 “On the Relations of Universals and Particulars”(Bertrand Russell). 10 From the Tractatus Logico-Philosophicus(Ludwig Wittgenstein). 11 “Particular and General”(P. F. Strawson). 12 “On What There Is”(W. V. Quine). 13 “The Identity of Indiscernibles”(Max Black). 14 “Proof of an External World”(E. Moore). 15 From On Certainty:( Ludwig Wittgenstein). 16 “Knowledge by Acquaintance and Knowledge by Description”(Bertrand Russell). 17 “The Problem of the Criterion”(Roderick Chisholm). 18 “Is Justified True Belief Knowledge?”(Edmund Gettier). 19 “Studies in the Logic of Explanation”(Carl Hempel and Paul Oppenheim). 20 “The New Riddle of Induction”(Nelson Goodman). 21 “Epistemology Naturalized”(W. V. Quine). 22 “Criteria, Defeasibility, and Knowledge”(John McDowell). Part IV: Philosophy of Mind. 23 “Sensations and Brain Processes”(J. J. C. Smart). 24 “The Nature of Mental States”(Hilary Putnam). 25 Sense and Sensibilia(J. L. Austin). 27 “What is it Like to Be a Bat?”(Thomas Nagel). 28 “Mad Pain and Martian Pain”(David Lewis). 29 “Can Computers Think?”(John Searle). 31 “Individualism and Supervenience”(Jerry Fodor). Further Reading in Philosophy of Mind. Part V: Freedom and Personal Identity. 32 “The Conceivability of Mechanism”(Normal Malcolm). 33 “Freedom and Resentment”(P. F. Strawson). 34 “Human Freedom and Self”(Roderick Chisholm). 35 “Alternative Possibilities and Moral Responsibility”(Harry Frankfurt). 36 “The Self and the Future”(Bernard Williams). 38 “Action, Reasons, and Causes”(Donald Davidson). Further Reading in Freedom and Personal Identity. 39 “The Subject Matter of Ethics”(G. E. Moore). 40 “The Emotive Meaning of Ethical Terms”(Charles Stevenson). 41 “Justice as Fairness”(John Rawls). 42 “Modern Moral Philosophy”(G. E. M. Anscombe). 43 “Morality as a System of Hypothetical Imperatives”(Philippa Foot). 44 “The Elimination of Metaphysics”(A. J. Ayer). 45 “Empiricism, Semantics, and Ontology”(Rudolf Carnap). 46 “Two Dogmas of Empiricism”(W. V. Quine). 47 “In Defense of a Dogma”(H. P. Grice and P. F. Strawson). 48 “Philosophy and the Scientific Image of Man”(Wilfrid Sellars). 49 The Blue and the Brown Books(Ludwig Wittgenstein).